This must-have features not one, but two layers of advanced hybrid protection! Layer 1 is a durable silicone cover that is a perfect fit over your iPad mini. Layer 2 is an impact resistant polycarbonate hard shell that easily wraps around the silicone layer....providing dual protection for your tablet. All controls and ports are easily accessible for instant operation while the power and volume control are covered by raised silicone delivering extra coverage. The heavy-duty hard case features a kick-stand for convenient placement on a desk or table.....perfect for media viewing, face time or typing! The tough silicone side bumpers and the sturdy polycarbonate grips minimize movement on flat surfaces and promote grip ability. 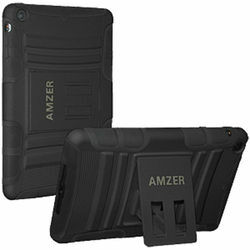 This hybrid case features a rugged design for advanced protection for your active lifestyle! Keeps Your iPad mini Secure and Protected. Advanced Locking Mechanism Holds iPad mini Securely. Low-Profile Built-In Slider Stand for Easy Horizontal Viewing. Product Information This must-have features not one, but two layers of advanced hybrid protection! Layer 1 is a durable silicone cover that is a perfect fit over your iPad mini. Layer 2 is an impact resistant polycarbonate hard shell that easily wraps around the silicone layer....providing dual protection for your tablet. All controls and ports are easily accessible for instant operation while the power and volume control are covered by raised silicone delivering extra coverage. The heavy-duty hard case features a kick-stand for convenient placement on a desk or table.....perfect for media viewing, face time or typing! The tough silicone side bumpers and the sturdy polycarbonate grips minimize movement on flat surfaces and promote grip ability. This hybrid case features a rugged design for advanced protection for your active lifestyle! More information Features: Keeps Your iPad mini Secure and Protected. Provides a Fashionable Look and Feel. Advanced Locking Mechanism Holds iPad mini Securely. Lightweight Durable Protection. Low-Profile Built-In Slider Stand for Easy Horizontal Viewing. Rubberized Material Works as Added Grip Support.